It may be impossible to dial back the clock to reclaim the all the unbridled happiness of youth - but old as we get, the pure pleasure of spending time with a puppy is one that cannot be outgrown. Sergeant Tony Marshall from the Kingston Police in the U.K. recently paid a visit to the Star & Garter nursing home, along with five playful police dogs. After delivering a safety presentation, Marshall stuck around to introduce the facility's residents to his furry colleagues - including Daisy, an 11-week-old police pup in training. Not wanting the less-mobile patients to miss out on the experience, Marshall took the puppy upstairs to visit with them as well. There, Daisy made the acquaintance of a woman named Muriel, who, sadly, seems to have been a little short on joy of late. Daisy was the perfect fix - and Muriel's smile said it all. 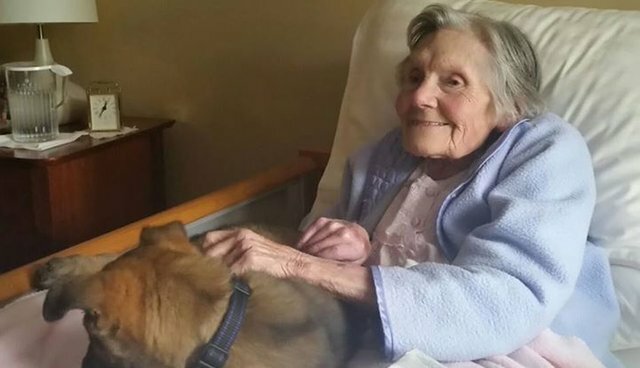 "Muriel has been at the Star & Garter for a few months now and the nurses say she is normally very quiet and doesn't show much emotion," the Kingston Police wrote on Facebook. "However when Daisy was placed on her lap in bed she lit up and gave us a big smile! This sort of reaction is so unusual for Muriel that it caused her nurse to cry." "I was shocked to see Muriel's reaction and I would like to thank the Star & Garter for having me," he said. "It was a great opportunity and something I will remember for the rest of my life."